Pandemonium is an infinite realm of pain and suffering. While you can find a good deal of loot there, all these treasures are guarded by demons and even crueller demon lords. Many a hero, confusing confidence with megalomania, has died screaming in the barrage of torment and hellfire. Pandemonium is endless. Portals there are found abundantly in the deeper parts of the main dungeon. Note that getting back might be more difficult. This gate leads to the endless halls of Pandemonium. Tales about successful lootings of these netherworlds are rare. Even the strongest and most experienced characters can die there. On the other hand, these halls contain several runes and lots of valuable items. It is much easier to get in than to get out. The demonic rune, lost somewhere in the endless halls of Pandemonium. The fiery rune, guarded by Cerebov. The glowing rune, guarded by Mnoleg. The magical rune, guarded by Lom Lobon. The dark rune, guarded by Gloorx Vloq. Like the Abyss, Pandemonium is an infinite space containing endless opponents and loot, and you may explore it for as long as you like. However, unlike the Abyss, Pandemonium is comprised of individual, randomly generated realms, rather than an unmappable and limitless plain. Each realm is the size of an ordinary Dungeon floor, can come in a wide variety of layouts, usually contains one Pandemonium lord vault, and may contain a rune of Zot. In fact, the only items guaranteed not to generate here are unrandarts; apart from the sword of Cerebov, no unrand will ever generate in Pandemonium. You may enter Pandemonium through any Pandemonium entry portal, which can generate on Depths:1-5. Traveling from one realm of Pandemonium to the next can be accomplished through a transit portal, several of which can be found on each floor. Bear in mind that once you leave a particular realm, you will never be able to return to it again, potentially resulting in the permanent loss of runes of Zot. Exiting Pandemonium can be accomplished through either an exit portal, or by instead entering a portal to the Abyss. Actual exit portals are very rare, but they most commonly show up inside of a Pandemonium lord's vault, and each Pandemonium rune you collect increases the odds of finding an exit. Abyss portals are somewhat more common, but do require you to then escape the Abyss in order to return to the Dungeon. Note that self-banishing via a distortion weapon is not an actual way out: after banishment, using the Abyssal escape portal simply returns you to the Pandemonium realm on which you were banished. Be aware that each time you travel to a new realm in Pandemonium, you will be placed at an entirely random point. There is no guarantee that another portal will be anywhere near where you enter, or that you won't be dumped in the middle of a horde of powerful demons. If your character knows any buff spells, it is a good idea to cast them before entering any portal. Any given realm of Pandemonium is capable of throwing almost any demon above tier-4 at you, but each realm is inhabited by only a fraction of the possible demons you can encounter. This means that you will be encountering tier-1 and -2 demons as a regular occurence; don't even consider entering Pandemonium unless you are comfortable with this. Also, there are a wide variety of demonspawn opponents here, each of which has a unique type and occupation, much like the draconians of the Realm of Zot. Although less of a threat than the most dangerous demons, their abilities can range from aggravating to devastating, and they tend to appear in swarms. See this article for further details. More dangerous than the demonspawn, hell sentinels, and fiends, however, are the Pandemonium lords. These are essentially randomly generated uniques, each of which has its own resistances, attack brand, and spell set. They also tend to generate along with a very large horde of demons appropriate to the floor, making it a fairly common occurrence to come across multiple sources of torment, heavy elemental damage, and a powerful unique all at once. Always examine a Pandemonium lord before engaging it in combat, and always act carefully; there's a chance that it'll be a pushover, but it's just as likely to be one of the deadliest opponents in the game. Although players can conceivably acquire unlimited experience and treasure by farming Pandemonium realms endlessly, doing so serves little purpose; it is dangerous enough that most players capable of handling it already have all they need to clear the rest of the game. Searching for potions of mutation or items to open a treasure trove may be rewarding, but bear in mind that there are plenty of sources of bad mutations here as well. The main reason for anyone to enter Pandemonium is to retrieve its five runes of Zot. Hellion Island - A square of terrain, surrounded by lava, populated by dozens of hellfire-flinging hellions, all led by a single Pandemonium lord. Extremely dangerous: one false move and you receive 5-8 hellfire bursts. Always be wary of lava pools as an indicator of this level. Eyes of Draining - Eight carefully spaced eyes of draining, locked away behind grates, will devastate your MP as you deal with a Pandemonium lord and its cohorts. The rune is locked away in a ninth cage in the center. Smiting - A hallway lined with smoke demons, locked away behind grates. These will smite you repeatedly as you deal with the horde inside. Frozen Over - An open area filled with multiple blizzard demons, with an ice statue in the middle sitting on top of the rune. The statue is surrounded by deep water, preventing easy access. Expect heavy cold, electricity, and Airstrike damage. The Shining One's Fortress - see the section below. Once you have acquired the demonic rune, it will never appear again. If you fail to acquire it in a given realm before leaving, however, it will still appear in a future realm. Along with the endless random realms of Pandemonium, traveling from realm to realm will eventually bring you to four unique realms, each of which is ruled over by a unique Pandemonium lord. Upon entering one of these, you will receive a message declaring whose realm you've entered. You can only enter each of these realms once per game; once you've left these realms, they are forever lost to you, taking any unclaimed runes with them. As such, it is best to delay entering Pandemonium until you are confident in your ability to take on all four challenges. An item of great power still resides in this realm, and once you leave you can never return. Are you sure you want to leave? It is entirely possible to steal these runes without killing the unique Pandemonium lords which guard them. Clever use of fast movement speed, scrolls of magic mapping, Lee's Rapid Deconstruction, Shatter, and Apportation can allow you to snag the rune quickly and (relatively) safely. However, be aware that the respective Pandemonium lord will reappear and chase you down on later floors, unless and until it is slain. Similarly, failure to kill a unique Pandemonium lord whose rune you've stolen will add that lord to the list of enemies which may attack you during your ascension. Searing heat pours from the floors and walls of this place. The mighty Pandemonium lord Cerebov resides here. The fiery rune of Zot is guarded by Cerebov, a powerful giant and master of Fire Magic. Its realm is primarily made up of long narrow hallways which intersect with small rectangular chambers, but roughly half of the map will consist of a massive metal fortress. Fully exploring the fortress will reveal several small treasure chambers, and killing Cerebov will reward you with the sword of Cerebov. Max out your fire resistance, and see the Cerebov article for further advice. The air here is shimmering with an eerie glow. The mighty Pandemonium lord Mnoleg resides here. The glowing rune of Zot is guarded by Mnoleg, a chaotic jester who delights in mutating its foes. Mnoleg's realm offers wide hallways and occasional doors, while its vault is made up of several wide diagonally crossing hallways. Apart from the rune, there is no guaranteed treasure to be found here. Use a source of mutation resistance, a ring of sustain attributes, and an amulet of stasis while here, and see the Mnoleg article for further advice. You sense a powerful magical presence. It is not pleased. The mighty Pandemonium lord Lom Lobon resides here. The magical rune of Zot is guarded by Lom Lobon, a powerful archmage demon who can inflict devastating amounts of electricity and cold damage. The realm is made up of crossing vertical and horizontal hallways and small chambers, while the rune vault is a massive green crystal structure, much of which is submerged in deep water. Both Lom Lobon and the rune reside in the large chamber in the center of this structure. Apart from the rune, there is no guaranteed treasure to be found here. Bring some electricity, poison, cold, and magic resistance, and see the Lom Lobon article for further advice. Shadowy figures dance across your vision. The mighty Pandemonium lord Gloorx Vloq resides here. The dark rune of Zot is guarded by Gloorx Vloq, a hooded demon with spectacular speed and access to all manner of devastating Necromancy. The floor is filled with open chambers and wide hallways, while Gloorx Vloq's vault is a large chamber filled with pillars, Executioners, and a back chamber containing the rune. Apart from the rune, there is no guaranteed treasure here. See the Gloorx Vloq article for further advice. The tension of great conflict fills the air! Along with the four unique panlord realms, you may come across this realm in your travels. 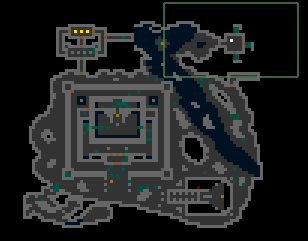 Populated only with holy opponents, the Shining One's Fortress contains significant amounts of treasure, three exit portals located in a corner far from where you spawn, and the demonic rune of Zot (if you haven't found it yet elsewhere). Undead and demonspawn characters should proceed with extreme caution. The rune can be found in the treasure vault at the center of the fortress, guarded by the seraph and his allies. Along with the endless stream of Pandemonium lords, there are also two unique non-boss enemies found here: Mennas the Voice of Zin, and Ignacio the executioner of Makhleb. Mennas is a fast and competent melee fighter who has a tendency to silence everything around him (except for the resident demons, of course). Ignacio, meanwhile, is even faster and carries a well-enchanted executioner's axe of pain. Either can very rarely be found wandering any of the realms of Pandemonium. If you encounter one and fail to kill it, it may still show up in later realms. Fire resistance, preferably rF+++ when facing Cerebov. Cold resistance, preferably rC+++ when facing Lom Lobon. A source of electricity resistance when facing Lom Lobon. A source of poison resistance when facing Gloorx Vloq or green deaths. Any source of torment resistance for dealing with fiends, tormentors, and Gloorx Vloq. Some inventory space for the loot you come across. A wand of digging, or spells that destroy walls. Some exits (along with pan lord) lie just behind a rockwall. Of course, you don't necessarily have to gather all five runes in a single trip. Leaving Pandemonium and then returning after you've resupplied or levelled up has no punishment, and any of the preset realms you have not yet visited will still be waiting for you when you return. Just be aware that you do not get to choose when you find any given preset realm, or even an exit. In 0.21, the rate at which unique pandemonium floors appeared was increased. Prior to 0.18, Pan did occasionally offer a Ziggurat to conquer, but no more. Prior to 0.17, Pandemonium didn't spawn primarily tier 3 and above demons. Prior to 0.16, Mennas could not be found in Pandemonium. Prior to 0.14, Pandemonium runes carried did not increase your odds of finding an exit. Pandemonium did not feature a set of demonspawn monsters. Prior to 0.10, self-banishing via a distortion weapon was an effective way to escape, equivalent to using a portal to the Abyss. Prior to 0.9, there were infinite demonic runes of Zot. The record for most collected came in at over 250. Prior to 0.7, scrolls of magic mapping and Lugonu's Gate yourself to the Abyss ability were both disabled in Pandemonium. Prior to 0.6, you received no warning message upon entering the realm of a unique Pandemonium lord. This page was last edited on 20 November 2018, at 20:00.